We’d love your help. 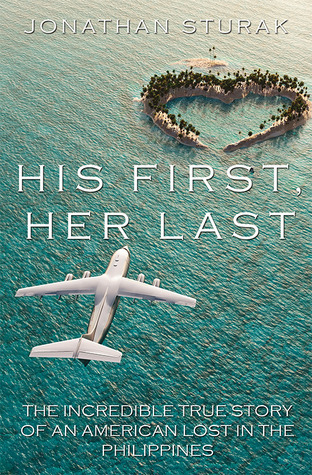 Let us know what’s wrong with this preview of His First, Her Last by Jonathan Sturak. To ask other readers questions about His First, Her Last, please sign up. I am utterly insulted! This character, Jason, was self-absorbed, tactless, and downright disrespectful. His observation of the Philippine culture was stereotypical and deficient (< ten day trip would make one an expert, right? –sarcasm--). Even if some of the remarks were true, his attitude in its presentation was offensive to the Philippine people. The straw that broke the camel's back for me was when he was desperate to get out of the Philippine hospital because he felt that he would not ge I am utterly insulted! This character, Jason, was self-absorbed, tactless, and downright disrespectful. His observation of the Philippine culture was stereotypical and deficient (< ten day trip would make one an expert, right? –sarcasm--). Even if some of the remarks were true, his attitude in its presentation was offensive to the Philippine people. The straw that broke the camel's back for me was when he was desperate to get out of the Philippine hospital because he felt that he would not get the proper treatment. He was in a rush to contact the U.S. Embassy (sound Hollywood, anyone?) to get him out of the horror of such primitive amenities. Sure the technology in the U.S. would be better but please show some respect to your host country. Don't be so rude and flaunt your hand sanitizer and remarks of disgust. The character of the main protagonist was not the only flaw in this book. The entire plot of the book was questionable. From the title and blurb, it would have one believe that there would be a story of romance. I didn't feel any romance between Jason and Hazel. No depth in the relationship was conveyed. The descriptions were one dimensional and vain. Even with the "lives of this couple flash before their eyes" accident or "I almost died when I was five" incident, the events were mechanically recounted. If anything, I felt their relationship was twisted (Jason flirted with Hazel's best friend and Hazel was ignorant to Jason's true character). Instead, the storyline was mainly about pointing out a skewed image of third world countries, in this case, the Philippines; as dirty, dumb, and behind the times. The author is a good writer. This book was well written in applied terms. The grammar was good. The breaks were at the correct places. Smooth technical reading. The flaw was in the content of the story and the flamboyance to the telling. Take away the insults and have more of the caring Jason (like his tenderness with his soon–to-be nephew, Tony). Moreover, I believe that the author thinks he is doing a service by writing this book. Absolutely not! The tips at the end for travelers might be sound but again an example of disrespect. I have never felt more passionate about not recommending a book than this one. This book is definitely a "don't bother"! Please, don’t bother. I already bothered for all of us. By the way, this book was based on the author's true account of his trip to the Philippines, so this would be a memoir, hence a non-fiction. Yet, his character name was different. So would that make this fiction? Oh, the flaws are endless. I got a free copy of this book for review and I must say that I have mixed feelings about this. Well, first up, I am from the Philippines and yes, although it's kinda funny that some of the stuff written here are true, others I think were just too...exaggerated and magnified. Here's what I have to say: The Philippines, though it's not America or any other place in the world, though there are things that happen here that would make you feel queasy or whatever, IT IS NOT A BAD PLACE. Not a god-dam I got a free copy of this book for review and I must say that I have mixed feelings about this. Well, first up, I am from the Philippines and yes, although it's kinda funny that some of the stuff written here are true, others I think were just too...exaggerated and magnified. Here's what I have to say: The Philippines, though it's not America or any other place in the world, though there are things that happen here that would make you feel queasy or whatever, IT IS NOT A BAD PLACE. Not a god-dammed place that you can't visit again. I know, I know, the author had a really traumatic experience and yes, I'm taking that into consideration but the thing is...you shouldn't really put the Philippines in THAT light because hello, some people here actually earn, some people actually have nice homes, and not everyone is poor or smelly or whatever. What irritated me is that almost every description of a person in the book had some "he looked like he hasn't showered in days" lalala and it was like, enough already, okay? It's so not that way. And while I appreciate the fact that he loves his wife and that he was good to the family, everything else was just...ugh. I'm sorry. Plus, yeah, I agree with Hazel that the protagonist Jason is kind of a mama's boy, sorry about that. The first book that I read by this author was Clouded Rainbow. It was a great story and I loved it. When Jonathan Sturak released this, his latest book, he messaged me out of the blue and asked me if I would be interested in reading it. Knowing how much I loved his previous book, and seeing his words about how personal this book was to him, I agreed. I wanted to love this book as much as I loved Clouded Rainbow ... but I just couldn't. I've actually been putting off writing this review for several The first book that I read by this author was Clouded Rainbow. It was a great story and I loved it. I wanted to love this book as much as I loved Clouded Rainbow ... but I just couldn't. I've actually been putting off writing this review for several days because, well, I just didn't know what I was going to say about it. I'm actually stuck between giving it 3, 3 1/2 and 4 stars. There were parts that I did like and I tried not to let the parts that I didn't like overpower me, but I think those parts overpowered what could have been a beautiful story. It saddens me even more when I see that it is based on a true story. When authors ask me to read their books, I never read the reviews that are already up for fear that I will go in to it with someone else's thoughts and opinions in my head. I also don't read past the first few sentences of the description because, let's face it, some give away WAY too much information and I want to enjoy the story rather than read anticipating things. When it came to this particular book, I never even looked at the Amazon or Goodreads page, just downloaded it onto my Kindle and jumped into it as soon as I had the chance. Because of my lack of research into the book, I was completely unprepared for the main character's ... um ... feelings for his fiance's best friend. And, to be honest, I disliked that aspect of the story. It would have been different, I guess, if it would have been one or two thoughts - but it was a CONSTANT thing. Each time it made me uncomfortable and left me feeling sorry for his fiance, that he could behave this way in the first place, but that he was also doing it in front of her. It was inappropriate and ... disgusting. There was laughing and joking about it from the fiance and parts of her family, but she had no idea the thoughts that were really going on inside his head. I liked the fiance and her family. I loved how they treated him as if he was part of their family from the very first meeting. I loved the descriptions of his surroundings - when he actually took the time to notice how beautiful the country around him was. But, after he finds her and she is ok, he goes right back into his complaining and his obsessive need to leave the country, no matter what doctors tell him. Like a train wreck, this book was hard to look away from. The author's America-centric world view and cultural expectations were cringe-worthy. Having lived in the Philippines for 10 years from the 1970's to 1980's, I thought I would appreciate seeing an outsider's view of the country for a touch of nostalgia. Yet even I, with all my youthful naiveté, could not have rivaled this fellow for his unrealistic expectations of life in a third world country, his ignorance of what is "normal" for others Like a train wreck, this book was hard to look away from. The author's America-centric world view and cultural expectations were cringe-worthy. Having lived in the Philippines for 10 years from the 1970's to 1980's, I thought I would appreciate seeing an outsider's view of the country for a touch of nostalgia. Yet even I, with all my youthful naiveté, could not have rivaled this fellow for his unrealistic expectations of life in a third world country, his ignorance of what is "normal" for others around the world, and his irrational fears. As a Filipina who has been in a relationship with a European man that I now married, it piqued my interest when I receive a request to review this book. I was truthfully eager to start reading and know the experience of another foreigner in the Philippines. And before I get to the point, I want to mention that I want to applaud the author for his clever observation about the Philippines. Many foreigners go to the Philippines then they go back home, thinking they’ve been to paradise, that’s because-not all- but many foreigners who went to the Phililippines for vacation only experience the tourist places, the organize environment for tourist and for the rich and the famous, but that’s just a part of the Philippines. Jason (the protagonist) experienced the real Philippines with its good and bad. Anyway here comes why I didn’t give this book a five star even though I REALLY LIKED IT. 1) Okay, many Filipinos might go and get defensive saying “it’s not that bad” but I’d say: “it is that bad” at less in the poor Philippine areas but I’ll agree with one of the reviewers before me in Goodreads. Jason did make it sound like no one take showers there. Just to state the fact many Philippines are very conscious about appearance. Doesn’t matter if the house looked like it’s about to fall, washing up is something many prioritize, especially if they are to work in a bit “normal job” (I specially noted it on the Flower man) and yes, some might mix up, he/she, him/her. But I find that really strange, anyone who has been in school for at less grade 4 should be able to use it perfectly. I have yet to meet someone who needs to be reminded so many times. 2) I’m actually maybe gonna rate this with 5 stars if Jason hadn’t annoyed the hell out of me. In the beginning I feel like Jason was overly cautious (way over the top) then the incident with the cops. One shouldn’t need to travel the world to know that a place like the Philippines is a place where rules are often ignored in exchange for a price. And sure he’s in a foreign country but does he have to behave like a helpless kid when the beggar kids flocked around him? 3) And okay, food isn’t the best the Philippines could offer (I personally think so too) but does he have to behave as if everything given to him is a potential poison, with the exception of pizza and McDonald food? McDonald might be licensed from US but he should know that the foods they serve there are cooked in the Philippines! So, tell me. What’s the difference between that and the meal serve from a high class restaurant which is not American license? 4) Hand sanitizer much? Why does he keep spraying himself for every Filipino he encountered? I’ve met, talk and become friends with a lot of western people and seriously, they don’t carry around a sanitizer and squirt their hands for every thing, that won't keep you completely safe. Soap and water that's what you need. Okay this is a personal opinion I’m not trying to hurt anyone who love using it. 5) And what annoyed me most with Jason is that, I feel like he has sexual desire of all Hazel’s friends. Especially Joy. Others might say “it’s okay that’s what being a man” but no, for me he’s actually cheating on Hazel—mentally or physically makes no difference and especially irritating because it’s his fiancée’s best friend. No, his fantasy over her is just to much to ignore. I actually really wanted to stop reading the story at 20% but out of respect for the author, and I promised a friend to finish it to the end so I forced myself to finish reading this story. And so, with all that being said, I would like to say that this book made a lasting impression on me, the author writing was neat, I also like his style, the book was easy to read (though his personal thoughts really disturb me sometimes), it would have just been more entertaining if Jason has a more likeable attitude. The only thing I like about Jason is that he sympathizes for the animal and that we both have Back to the Future as a favorite movie, but throughout the story I did learn to respect him for his honesty and I feel really sorry for what he has gone through. At first I was excited to read about daily life in the Philippines. But pretty soon I was very disappointed. It reads like a first time novelist with choppy paragraphs and a draft-like feel. It was insulting to see how naive this man was about visiting another country. Of course you check your cell coverage ... find a hospital ... do your research. It portrays Americans as idiots. And the hand sanitizer!? Really?! Not impressed. Do not recommend. I'm a huge fan of Jonathan Sturaks work. This story was very different from what I've read of his. Based on actual events in the author's life he tells of an amazing journey to the Philippines to meet and visit his fiancee Hazel's family. From the moment Jason and Hazel arrived in her country, Jason finds himself questioning things he takes for granted. He is suddenly surrounded by the harsh realities of what life is like living in the Philippines, the poverty, the people and the lifestyles are m I'm a huge fan of Jonathan Sturaks work. This story was very different from what I've read of his. Based on actual events in the author's life he tells of an amazing journey to the Philippines to meet and visit his fiancee Hazel's family. From the moment Jason and Hazel arrived in her country, Jason finds himself questioning things he takes for granted. He is suddenly surrounded by the harsh realities of what life is like living in the Philippines, the poverty, the people and the lifestyles are much harsher. Jason's character reminded me very much of Jack Nicholson in the movie as good as it gets. The fears/phobias we all experience outside of our comfort zones. Fear of drinking water, eating food and the unknown. As Jason begins his journey of meeting Hazel's family and experiencing the old ways vs new he discovers the importance of his own family and what he's taken for granted. He also begins to care for and love Hazel even more as well as her family. When tragedy strikes Jason and Hazel's love and relationship are put to the test as family members from the Philippines and the States pull together. I was amazed at how well the author brought together both cultures and was able to give the reader a real feel of what it's like to leave everything you know for the unknown. The story grabs you from the beginning to the end. I think this is one of Jonathan Sturak's best stories. I gave this book 3 starts because it doesn't have an option to only give 2 1/2. I think I might have liked this book more if I wasn't so mislead by the title and cover picture. I assumed the story was about a man who while visiting the Philippines for the first time had experienced some horrific event, became lost in a foreign country and somehow overcame his circumstance all while dealing with the loss of his fiance. I was way off!! By Chapter 13 still nothing exciting happened. Halfway through I gave this book 3 starts because it doesn't have an option to only give 2 1/2. I think I might have liked this book more if I wasn't so mislead by the title and cover picture. I assumed the story was about a man who while visiting the Philippines for the first time had experienced some horrific event, became lost in a foreign country and somehow overcame his circumstance all while dealing with the loss of his fiance. I was way off!! By Chapter 13 still nothing exciting happened. Halfway through the book it started to become a chore to finish. There was an accident towards the end of the book, but the author was never physically lost in the Philippines. This is more of a self discovery story. After spending most of his vacation complaining and having a negative attitude towards his fiance's homeland and culture (and obsessively checking his security pouch, camera bag and hand sanitizer), Jason along with his fiance Hazel, her nephew, cousin and best friend are involved in a terrible motor accident. From this experience Jason realizes the beauty in the people and the country. I don't want to be too negative, the story was well written and very descriptive. Just was not something I would normally choose to read and a bit of a let down from what I was expecting. I was lucky enough to win a copy of this through a goodreads giveaway! It was the first time that I heard about Jonathan Sturak and I have to say that I am so thrilled to have found such a talented writer. This book brings so much to that table and the raw emotion conveyed is palpable. The characters are wonderfully portrayed and make you turning the pages from cover to cover! I am a filipino and while most of what's written is true, but, we don't eat sandwiches with rice. We have a problem with poverty and corruption but it doesn't make us any less human than you. It offends me that you always have to use your sanitizer and that you fear that your food is not safe. I will not read this for now and will continue next time. Slow start... seemed to drag in places. About 75% through the book peaked... and rapidly concluded. Almost too fast. Felt rushed. Read more book reviews at Book Junkie Joint. Poignantly accurate! This is a very insightful read about an outsider's point of view of the Philippines. It was interesting to read about my country from the eyes of a foreigner. Sure, I will have to admit that my country is not paradise, heck, it's even world-famous for its corrupt politicians, but it's not so bad really. It was understandable to read about Jason being all antsy and careful as regards the food and environment when he came to the Phili Read more book reviews at Book Junkie Joint. It was interesting to read about my country from the eyes of a foreigner. Sure, I will have to admit that my country is not paradise, heck, it's even world-famous for its corrupt politicians, but it's not so bad really. It was understandable to read about Jason being all antsy and careful as regards the food and environment when he came to the Philippines. It's normal to be scared of something you've never experienced, or some place you've never been to before. Besides, the Philippines is culturally different than America. I'd say that it was normal for Jason to imagine the worst of things about the Philippines, and the author realistically captured this. Story-wise, as this book was based on the real experiences of the author, I wasn't really expecting something majorly ground-breaking. Majority of the story-line wasn't exactly about the love between Jason and Hazel. It was about Jason's adventure in the Philippines and the way he almost lost Hazel due to an accident in a country with no adequate medical facilities. What I think was really beautiful about this story is that from Jason's perspective, the Philippines isn't even half of what the US is as a country, but the people from the Philippines make do with what little they have, and they can smile despite their circumstances. Personally, this trait is something I'm proud of. In the Philippines, we have this motto: "Kung maiksi ang kumot, matutong mamaluktot", which roughly translates to: "If the blanket is short, learn to bend (your legs)". Yes, the Philippines might not be as urbanized or as highly developed as the US, but we learn to adapt and make the best out of the hand we're dealt with. What else? Hmmm... Ah, yes, I was a bit disturbed while reading about Jason's sexual desires for other women. I'd like to think that this is because the women that Jason saw in the Philippines looked exotic in his eyes for being different, but really, it was still disturbing to read about him ogling other women when he has Hazel. Dude, just no. While I was delighted to read about my country in this book, in general, I don't think that this story would really appeal to other people from other countries. The details about the Philippines were spot-on and realistic, but portraying them in the book made it a bit dragging. Secondly, the story-line was simple, and not all that exciting. First off i want to say Jonathan is a great author and i really enjoy his writing style. And i did truly enjoy this book. I really can relate to so many things he talks about. You see im an American im married to a Filipina. I first traveled to the Philippines alone in 2006. My wife,son and I returned there this past September to visit family and friends. Ive been to manila and cebu. The country is beautiful and as jason mentions the people are mostly nice and courteous. The Philippines has its s First off i want to say Jonathan is a great author and i really enjoy his writing style. And i did truly enjoy this book. I really can relate to so many things he talks about. You see im an American im married to a Filipina. I first traveled to the Philippines alone in 2006. My wife,son and I returned there this past September to visit family and friends. Ive been to manila and cebu. The country is beautiful and as jason mentions the people are mostly nice and courteous. The Philippines has its share of issues. Like any country. But i would never have any dread or fear of visiting a 3rd, 4th or fifth time. I love the phils and its people. I would like to state if i wrote this book and my wife read it she prob would not talk to me for a month. You see the problem being. There is so much negativity written about the Philippines in general with this book. There is one thing i have found to never say to my wife and for the most part all filipinos. Do not talk negatively about ones country. They are proud people. She really dislikes all the stereotypes that people display. ( The barrage of negativity about the food they eat,the jokes everyone makes about, hey is your wife one of those mail order brides, etc). All this stuff hurts. The phils may not have the richest,cleanest most environmentally friendly country in the world but they make due with what they have. My wifes nieces cooked, washed our clothes,ran errands. Whatever we needed they were there to help. Their hearts were as big as the moon. Just curious. With all the lusting after joy. Do you really truly love hazel? Im just wondering if hazels family have read this book? I would seriously be ashamed and could only imagine how they may feel deep inside with the constant downplaying of the filipino culture. Makes one feel that they are inferior as a race compared to countries such as the usa. Which in gods eyes we are all the same. Again this is a nice read and i did enjoy it. But i can only imagine how hurtful it could be to a select few. As i finished this book my wife asked how did i like it. Well i did hun. But i just dont think you would care for it. A note to jason. If you do ever go back to visit, lighten up. No need for the constant fear of every unknown situation. The anxiety and the gallons of hand sanitizer that you mentioned that you were using. The phils is really a great place. Just get over all this germaphobic paranoia. Jonathan Sturak’s fifth book (his fourth novel) is his most accomplished work to date. The main character, Jason Stefanik, is an all American boy: raised on the east coast, a college graduate, and a young man with a steady career in computer technology. His fiancée, Hazel, is a beautiful Philippine woman adjusting to life and work in the states, yet understandably she is nostalgic for her family back on the islands. When the couple takes a trip back to Hazel’s native country, the vacation become Jonathan Sturak’s fifth book (his fourth novel) is his most accomplished work to date. The main character, Jason Stefanik, is an all American boy: raised on the east coast, a college graduate, and a young man with a steady career in computer technology. His fiancée, Hazel, is a beautiful Philippine woman adjusting to life and work in the states, yet understandably she is nostalgic for her family back on the islands. When the couple takes a trip back to Hazel’s native country, the vacation becomes a journey of self-discovery that challenges Jason’s anxieties and tests the strength of his and Hazel’s love for each another. The story is compelling on different levels with its blend of folly, romance, tragedy, and drama. Sturak is a master at transitioning his narrative from scenes of fun and amusement to horror and dread. In each of his previous books, Sturak has demonstrated his tremendous command of plot and pacing. This novel continues that signature feature of his writing. His prose has a fluidity that’s incredibly addictive. The plot unravels with shocks and twists. Sturak often employs a spare style to keep events moving quickly. When he invests in description and depth, his passages are memorable and the book elevates to a high level of beauty. Even as events race forward, he makes a reader feel everything in the surroundings of the country. I won a copy of this book from the Goodreads First Reads Giveaway program. Many thanks to the publisher/author for giving me the chance to read and review this book from the Goodreads First Reads program. This was a really hard book for me to get into. It ended up being a slow, kind of painful read. Maybe the writing style just doesn't appeal to me. I liked that the story was so in-depth, but it also tended to drag at times. I'm never been to the Philippines, nor do I know much about it, but the I won a copy of this book from the Goodreads First Reads Giveaway program. Many thanks to the publisher/author for giving me the chance to read and review this book from the Goodreads First Reads program. I'm never been to the Philippines, nor do I know much about it, but the author did a good job with the details and descriptions. It almost made me feel like I was there. However, even though I believe it's great to be saved, the constant checking of the hand sanitizer got a little annoying. This is marketed as a romance as well as a true story, but I didn't really get the romance vibe. At least not until near the end, and somewhat in the beginning. The rest of the book has the main character thinking about other women, and that made me like the book even less. I'm not a man, but it didn't seem right for the main character to come to the Philippines with his fiancee' and then think about her female family and friends--or buying them "secret" presents. This book just wasn't for me. Not bad, but I'd never pick this one up again. Maybe I can find someone to give it to who will appreciate it more than I currently do. A story based on the actual experiences by the writer on the Filipino culture, traditions and even some of the problems that the country have. It gives another perspective to a life in the Philippines through the eyes of a tourist. The story of Jason's adventure is an interesting insight and narration of the experiences that the author had. Amidst the bad experience that he had due to the accident, Sturak still manages to come up with a story that talks about love and hope despite the tragedy tha A story based on the actual experiences by the writer on the Filipino culture, traditions and even some of the problems that the country have. It gives another perspective to a life in the Philippines through the eyes of a tourist. The story of Jason's adventure is an interesting insight and narration of the experiences that the author had. Amidst the bad experience that he had due to the accident, Sturak still manages to come up with a story that talks about love and hope despite the tragedy that takes place in a country rich with heritage. Downloaded this book for free and am glad that I didn't purchase it. Jason's character annoyed me and I could not get a good picture in my head as to what he looked like and how he came to be the way he was. The way he behaved had me intrigued, but not in a good way. I felt bad for Hazel the entire time. I also felt as if there was a lot of build-up and then all of a sudden the book was over. Not what I was expecting. This was a free book. I had a hard time getting into it. I started reading four different books, one chapter at a time. The author wrote the story of his trip to the Philippines with his fiancee. He lusted after Hazel's best friend, Joy. It was hard to understand why Joy got the task of watching out for Jason. I read some of the other reviews, and one was harsh on the authors version of life in the Philippines. This was a difficult book to read. I'm glad it over. As an American I take so much for granted. Good hospital care, flushable toilets, even a soft bed. Through the eyes, and sad yet magnetic memories of the author I have realized my own naïveté. Whilst reading of the lives of those living in the Philippines I had to constantly remind myself this book tells a story of just a couple years ago. I kept wanting to believe people only lived like this a hundred years ago... A poignant and worthwhile read for sure. I was sucked in as soon as I started reading this book. It was like reliving my life 30 years ago when my husband and I lived in the Philippines. Every detail was so accurate that it was as if I had wrote the first few chapters myself. For those of you who have lived or visited the Philippines to those who would like to experience the culture, I highly recommend that you read this novel.